The title of the figure might be "Vinz Clortho," aka The Keymaster, but we all know who this is really - it's Louis Tully, the accountant who's neighbors with Dana and later the lawyer for the Ghostbusters. Louis is the quintessential nerd. While a very good natured guy, he sported a level of social awkwardness that eclipsed even Egon's. He tries to be hip and cool, but never pulls it off. (He would work out to exercise videos, but at double speed.) Tends to be obsessive compulsive when it comes to matters of taxes. More often than not conversation with him will eventually steer into tax or monetary matters. He's always willing to help out, sometimes with embarrassing results for him. And he'll always point out an opportunity to a friend where they can save money on something, like pain reliever. He's also shown to be pretty good with children. A manner he admitted learning from having a pet hamster. 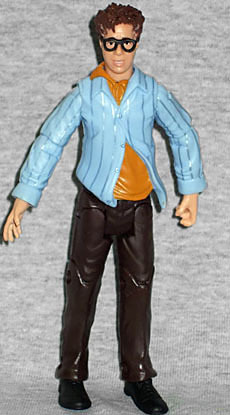 Hilariously portrayed by Rick Moranis, he's the ideal character to get a toy in this line; although this isn't the first time we've ever had a Louis Tully action figure, having had toys based on his appearance in the Real Ghostbusters cartoon, he fits in nicely with the other cast of characters around the Ghostbusters you want to have in your collection. The drawback is that the Ghostbusters toys Mattel is producing are primarily two-packs - featuring one character and one notable accessory, usually a ghost - and Louis is here all by his lonesome, making his $20 pricetag complete nonsense. Vince stands about an inch shorter than the other Ghostbusters, the right scale as Rick Moranis is a short guy. His sculpt is really good - his face is very obviously Rick Moranis and his glasses, hair and clothes are all in a state of disarray, perfect for the character. His expression says it all, and it is great! Paint application is excellent also - the clothes are identical to how they were in the film and it compliments the sculpt. He's awesomely articulated with the same movement as the other Ghostbuster figures. In place of an extra figure, Louis includes several accessories: a slice of pizza, a jar of popcorn and interchangeable heads. Let's start with the pizza - this may be the most loseable accessory I've ever owned. It's tiny, slippery and fell right down into the couch as soon as I opened the toy. The jar of popcorn doesn't fare much better, in that it doesn't make any sense: it's the same issue that clothed 12" figures have, with the fabric being much too thick for such small figures. It doesn't scale right. You scale up this jar and the glass would be two inches thick. It looks ridiculous and the popcorn inside isn't painted, not even a quick wash, so it looks more like intestines than popcorn. He can also barely hold any of these accessories making them basically useless. 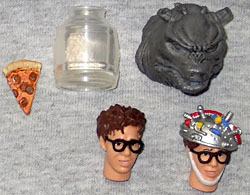 The interchangeable heads are better - in addition to his normal head, we have a head covered in Egon's awesome home-made brainscanning electrodes, which looks great and is fantastically detailed, and a Terror Dog head which fits over his normal head. It's fine, but... that's it? There's really not a lot here, and certainly not enough for your $30. So, the bummer isn't what is here, but is what isn't here - it would have been ideal to have had Louis in a two-pack with one of the Terror Dogs, and then had the other Terror Dog with the upcoming Dana figure, but instead we just get a single very overpriced toy, with a bunch of accessories that aren't fun. Even Walter Peck, a notably less-interesting-less-important character got more than this, with the containment unit. It's a bummer, because the figure itself is really good - but we deserve better.